It’s been more than a year since we first published our double stroller guide. With a fresh update for 2016 that added nine models to our test pack, we still think the City Select is the one to buy for most families. There is only one baby gear purchase that is more tricky in scope than finding the perfect stroller: finding the perfect double stroller. Buying a double stroller involves the same discussions about weight, features and maneuvering, but everything gets more complicated when you throw a 2nd seat into the mix. Of the hundreds of double strollers on the market, we think that the Baby Jogger City Select with the second seat is the best choice based on its easily configurable design, compatibility with one or two car seats and its ability to work for both same-age and multi-age children. The City Select can be bought as a single, and you can buy the 2nd seat later, or you can do it all at the same time. With optional bassinets, and car seat adapters thrown into the mix, there are 16 different configurations for use, plus a standing board option. Our team spent a combined 31 hours conducting research, interviews and testing, to come to our conclusion. Our real-world testing had our testers doing loops in the parking lot, on grass, and back and forth to the grocery store. When the testing concluded, we chose the Baby Jogger City Select as our favorite, as well as a step up and step down alternative. Who Should Buy a Double Stroller? There are generally two groups of parents who will shop for double strollers: parents expecting multiples, and parents with a toddler and an infant. While both sets of parents certainly have different needs, we found that the Baby Jogger City Select reasonably accommodates both groups. For these parents, a double stroller belongs on the “must have” list as a way to shuttle the youngest family members safely when outside the home. The prices of double strollers run the gamut, from as inexpensive as $150 to as high as $1,500+. While a top-of-the-line, high-ticket double stroller is not necessary for all families, it’s important to remember that this investment will be paying for itself for several years to come (and could even have an extended lifespan if you have more children). Lifestyle. How do you plan to use the stroller? Do you need something to roll down the sidewalks of your neighborhood, or inside stores? Or are you looking for something you can take off-road occasionally? How often will you use the stroller? These factors are important to picking out the one that will ultimately fit the needs of your family and will be able to hold up for several years. Comfort. For some families, a stroller that does the bare minimum is more than enough. For others, a larger storage basket, or adjustable handlebars, or even technology accommodations like places to plug in smartphones or mp3 players could all feel necessary to fully enjoying the purchase. The JPMA does offer some tips on things to double check when buying a stroller and outlines some safety reminders for secure use of the strollers. There is one other piece of advice Vallese says she always shares with parents buying a stroller or double stroller: Be sure it actually fits in the trunk or back of your car. Stephanie Gaitan is in charge of product and sales support at MacroBaby, an independent baby gear retailer located in Orlando. At any given time, the store has four side-by-side and four tandem double stroller assembled and on the sales floor, along with several single models that come with a second seat option (like our pick, the City Select) and a few stand-and-sit models. She says that the City Select is her top recommendation for parents who are shopping for twins or multi-age children. Like Vallese, Gaitan says it is important to do plenty of research and testing of double stroller models before deciding on the final purchase. “I tell parents that they should feel good about spending a little more on a stroller, or double stroller, because if they go the cheap route, they will end up needing to invest again,” she said. What Makes A Good Double Stroller? Each family situation will differ, along with parental preference when it comes to double strollers. There are some universal features that make a double stroller great, though. The first is being lightweight and easy to steer. Strollers are made to move, and while you may use them occasionally to contain children who are not in movement, you will want to be sure that you can relatively easily push the combined weight of the double stroller, the attached car seats, the added gear you bring along and oh yeah, the kids too. As double strollers go, you’re probably looking at something in the neighborhood of 25 to 40 pounds. The Baby Jogger City Selectis 28 pounds with the second seat attached, although you’ll fold it with the second seat off. For comparison purposes, the Britax B-Ready is 26 pounds with both seats, and the BOB Revolution Duallie Stroller (a side-by-side) weighs 34 pounds. No matter how great a double stroller might look, or whatever extra amenities catch your eye when shopping, remember that you are the one who will be pushing it for at least a few years to come—so make sure you are able to do that easily. Comfort for the riders is also an important feature of a double stroller. The ability to latch an infant car seat certainly makes this part easier for the first year or so, and the City Select and most other models allow for this. Try to consider the post-car seat days though. Long after your kids learn to walk, you will be strapping them into a double stroller (especially if you have multiples) so you want a model with durability, configuration options, adjustable harnesses and overall comfortable features. The City Select makes several accommodations as children grow, from the canopies that rise 24” above the seat (most competitors reach just 21”) to a seat width of 12.5 inches (this is the same in the BOB doubles but an inch more than more other competitors). There are also 16 different configurations (with the purchase of additional parts) that make it possible for parents to adjust to the preference and size of their children through the years of use. A good double stroller will also have easy folding options, and fold as flat as possible for storage and transporting by car. Other items that belong on the nice-to-have list for double strollers are handles that adjust for the height of parents, ample storage space, wide canopies that also have UV protection (the City Select has this feature), a five-point harness system for a safer ride, thick wheels that allow for at least minor off-road excursions, cup holders and other spaces for parents’ belongings like smartphones and wallets, and a simple and secure braking system. We went to a baby gear superstore where we had the opportunity to push and fold around a dozen of the most popular double stroller models, including our top three. When using them right after each other, it became apparent that the City Select was lighter, easier to navigate and overall more comfortable for the parents pushing it. We were also able to remove the second seat in under a minute and fold up the entire stroller in about 10 seconds. We asked the store experts to help us in the folding process and to show us the features (like the large storage basket and handbrake) that we had read so much praise about online. From there, we went online to compare their responses to a wider audience of parents who have purchased, used and loved double strollers in recent years. After reading through hundreds of reviews, we compared notes between what models parents recommend and what features they most often said they wanted or appreciated in a double stroller. We ruled out some of the lower-priced models early on, deciding that we wanted to recommend a stroller with long term durability, even if the price tag was higher than base models. The Baby Jogger City Select combines an easy to use set-up, and customizable design into a reliable package. Not only did the City Select maneuver better than other doubles, it gave us the flexibility needed for families of all sizes. Whether you have one, two or three with you, this stroller gives you as many as 16 different configurations, including using car seats or bassinets. To get over the various terrain and curbs, the City Select has large foam wheels, and a rear suspension. Think of it as a minivan with all-wheel drive. Like a minivan, it’s not the flashiest stroller on the market, but our pick gets the job done, even if it does so without the style of other doubles on the market. In addition to not being the most stylish stroller, it does have an above average price tag. We feel that this is justified, given the flexibility, reliability and ease of use that the Select provides. Our pick fits one, two or three kids, up to two car seats at a time, and can always be pared back into a single configuration. The canopies adjust for taller children too, so as they get older (even up to age 4) there’s still room for most kids in the seats. For parents who simply cannot afford or stomach the upfront cost of our pick, a good alternative is the Contours Options Elite Tandem Stroller for $300. Like the City Select, it has two tandem forward facing seats and a large storage basket underneath (with a side zipper, which is a nifty feature for sure). It has seven seating configurations and can accommodate two car seats at once. It comes with one car seat adapter that fits 20 of the most common brands, and the second car seat adapter is available separately for parents of twins. It has expandable mesh canopies and each seat accommodates up to 40 pounds each, which means families can use it for several years. The cons? Without car seats or kids the stroller weighs 47 pounds. There is also no way to remove the second seat if your older child phases out of it in order to use it as a single stroller. One consumer review mentioned that it was too heavy to lift into the back of her SUV without help. Based on features alone, and the price, this is a smart alternative for families who like a lot of the bells and whistles of our pick but need a smaller price tag. When calculating the value of these accessories, you end up with $340 worth of standard accessories that are not included with a City Select. The actual price difference ends up being closer to $20. That said, many parents may feel that they don’t need every single bell and whistle that the Vista offers. Depending on the age of the kids going in the stroller, you may not end up using the bassinet, which carries a $180 price tag if you were purchasing it separately. That said, our reviewers felt that the Vista strolled exceptionally well, even when fully loaded, thanks to a more vertical design. The children are closer to the parent, and the stroller’s weight trends towards the back of the stroller, not the front like on the City Select. We still like the City Select though, given that you can build the product you want, and save money on the things you don’t need. Who Else Likes the Baby Jogger City Select? Michelle Horton of Babble says that the Baby Jogger City Select made her husband “consider trying for a second child.” She applauds the easy-to-fold design, lightweight design and extras like ample storage and adjustable handles. She picked it as a “best overall” in a review on double strollers for Babble. Amanda Formaro of Family Corner praises City Select for its quick-fold technology, streamlined design and cool-factor. She says: “It mixes functionality with chic design in a way that actually might inspire you to take your baby out more often!” She mentions that celebrities like Salma Hayek and Julia Roberts have both been seen with the strollers (not a top reason to buy one, but nice to know that there is one with a price tag that allows you to be on the same level as the stars). Tasha Joanne of Crushed Cheerios, a self-proclaimed stroller addict, calls the City Select “amazing” and says that she especially loves the hand-brake feature. She says: “I have lost so many shoes to foot brakes on strollers in the years of being a nanny and a mother. The City Select features a hand brake on the side of the stroller that is quick and easy and very accessible. It makes using transit so much easier as I usually squish the stroller in a corner out of the way and when it’s my stop and the bus or train is crowded, I usually can’t reach the foot brake very quickly or gracefully.” She also likes the large storage basket, pockets on the back for other items, large canopies and the 16 different configurations for positioning kids (the standard version with a second seat comes with 6 different configurations; to get to 16, you have to purchase additional parts). Of the 212 Amazon reviews on the Baby Jogger City Select with 2nd Seat, 85% of reviewers awarded it with 4 or 5 stars. One mom said out of four double strollers she had tried, the City Select was her “go-to everyday stroller because it’s the narrowest, goes anywhere and folds compactly.” Along with other reviewers, she mentions the large storage basket and ability to add a variety of accessories as pros to owning the stroller. Baby Trend Sit N Stand Double Stroller–You get what you pay for here. While the price is low, the quality just isn’t there. Britax B-Ready–The 2nd seat has a lower weight capacity than the main seat. It’s also where a toddler must go until you no longer need a car seat for an infant. Heavy, and wide, there are much better alternatives on the market. Contours Options LT Tandem Stroller– At nearly 50 pounds, this stroller offers less in the way of strolling options, and is incredibly cumbersome when trying to put it in your car. Joovy Caboose Stand On Tandem Stroller–Differs from the pack in that it has one seat and a standing board. The rear seat doesn’t get a canopy and there’s limited recline options for the main seat. Overall, the stroller is heavy, bulky when folded and it suffers from poor maneuverability. Kinderwagon Hop–The Hop weighs in at around 21 pounds, making it significantly lighter than the pack. However, the seats are very small, so unless the kids are on the smaller side, or you start using this right at 6 months, there’s not a lot of room to grow. Mountain Buggy Plus One–This is a single stroller masquerading as a double. The company took an existing stroller platform, and added more fabric to make it into a double. This leads to smaller than average seats, and a very limited amount of space for the child in the rear seat. Phil and Ted’s Navigator–The Navigator borrows most of its design from past Phil and Ted’s options, lacking improvements that have helped the company fall behind the competition. Baby Jogger City Mini/GT–The GT is a deluxe version of the Mini. While both are category workhorses, they lack the features of other models listed, and do not include any accessories, making them more expensive than they appear on paper. BOB Revolution Flex Duallie–Works well as a jogger, but it’s a very large stroller to use for anything besides that. Britax B-Agile Double–Poor seat design lacks support. Older children are uncomfortable because they can’t sit up fully. Poor quality fabric, wheels and harnesses. Bugaboo Donkey–An uber-stroller with top of the line features, that comes in at around $1700 as a double stroller. Not for the faint of heart, the Donkey weighs close to 36 pounds. Bumbleride Indie Twin–The Indie Twin is between models right now, the 2016 model promises a revised fold, suspension and seat design. Until it arrives in mid-late summer, we’ll hold off on recommending it. Maclaren Twin Techno Stroller:–A good choice for short trips around the block, or for travel, but it does not offer the bells and whistles needed to truly be considered an everyday choice. Mountain Buggy Duet–The Duet’s claim to fame is that it’s 25 inches wide. That’s almost 4 inches slimmer than the rest of the side-by-side list. While great for those who need a super-slim stroller, it makes the seats very narrow. 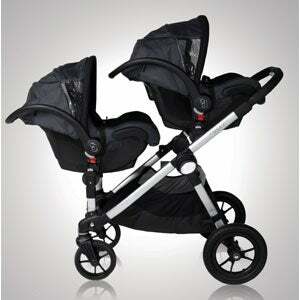 Peg Perego Book for Two–This double holds two car seats (only Peg Perego) and has a deep recline. That said, the seats are on the smaller side, and they lack the structure, leaving kids lurching forwards to sit up. UPPAbaby G-Link–The G-Link handles newborns well, but has a short seat that toddlers as young as 2 could be too tall for. On top of that it’s well over a hundred dollars more than similar offerings from Maclaren. Valco Tri-Mode Twin–The Tri-Mode Twin is the only stroller here that can fit three kids in seats on this list. Due to the added structure, the Tri-Mode Twin is going to be a larger stroller, that doesn’t have the refined fold that’s found on similarly priced models from Bumbleride or Bob. Listen for squeaking and pay attention to any tension in the joints. If you notice either thing, take it into a local bike shop for a lubrication tune-up. Wash stroller seat fabric in cold water, and avoid any solvents or caustic cleaning materials. Avoid putting seat fabrics in the dryer; simply put them back on the stroller for drying instead. Wipe down all plastic and metal parts with mild soap and warm water, then dry immediately with a soft towel. The same goes for the tires. Keep stroller stored out of direct sunlight to avoid fabric fading. Store in a dry environment and never store it outside. Avoid putting heavy items on top of the stroller, even when children are not inside it. This summer will see the Launch of the Austlen Entourage stroller, the do-it-all single or double with varied storage options that we highlighted in our ABC Kids Expo Roundup. The entourage will hold up to 150 pounds of stuff, and stretches out in front of you as needed. A premium entry, starting at $850, with lots of high-end touches like faux-leather handlebars. While not another double stroller, Lascal, maker of the BuggyBoard, will now have an optional saddle. This allows you to attach a standing board with a removable seat to almost any stroller. Their website has a handy configurator, so you’ll be able to know if your stroller is compatible with their products. The set-up will retail for a combined $170—$90 for the board, $70 for the saddle—making it an affordable option to add to your existing single stroller. The Baby Jogger City Select sits at the top of the pack because it can be everything to everyone. The Select can be configured in up to 16 ways, with bassinets, stroller seats or car seats. Did we mention that it fits two car seats simultaneously? This is a rare feature, which makes the stroller twin-friendly, too. It’s reasonably lightweight, highly-adjustable and it’s incredibly durable. The City Select is a smart investment, for families with one, two or even three kids. Baby Jogger City Select Stroller Consumer Reviews, Amazon.com. Baby Jogger City Select Stroller Consumer Reviews, BabiesRUs.com. Baby Jogger City Select Stroller Consumer Reviews, Target.com. Baby Jogger City Select with Double Seat, ConsumerReports.org. BOB Revolution Flex Duallie Stroller Consumer Reviews, Amazon.com. Britax B-Ready Stroller Consumer Reviews, Amazon.com. City Select Assembly Instructions, BabyJogger.com. Formaro, Amanda. Review: City Select by Baby Jogger, Family Corner Blog. Gaitan, Stephanie. Phone Interview. Product and Sales Support Manager, MacroBaby, Orlando. Joanne, Tasha. Product Review: City Select by Baby Jogger - Stroller, Crushed Cheerios. MacroBaby Baby Store, 1361 Florida Mall Ave., Orlando, Fla.
Mills, Kristian. The City Select by Baby Jogger Review (2014 Model). Kid Safety First. Vallese, Julie. Phone Interview. Consumer Safety Expert for the Juvenile Products Manufacturers Association.